Original documents released by Snowden reveal surveillance powers that go beyond root access, and into the hardware of all computer systems everywhere. The exploit hooks itself into a computer’s boot loader, initiating an “infected” BIOS that is in no way distinguishable from normal computer activity, and can only be discovered through forensic investigation of the physical data chip using electron microscopes. With GODSURGE, a complex malware loaded by the similarly named malware DEITYBOUNCE, secret agents are able to monitor users’ computer activity – even when the computer is offline – because the malware phones home when users plug back in, reporting activity and filling in historical gaps. It is safe from an operating system reinstall because it lives on the motherboard, and does not affect the installation at all, remaining undetected by antivirus scanners and even computer scientists. When Ross Ulbricht was found hiding among the stacks in the Glen Park public library in San Francisco, the 29-year-old Silk Road operator was believed to have covered his tracks perfectly. Speculation is rampant as to how he was really caught. Neckbeards with no working knowledge of Internet technology hypothesized that an “anonymous” forum post asking for help on specialized messageboard code led unseen internet police to backtrace his IP. 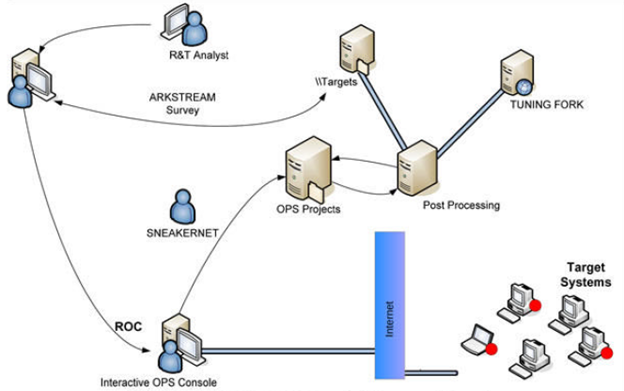 It is an unlikely connection, but compelling conspiracy theory, because it is a common supposition that the Internet is a self-referencing, self-cleaning hivemind; but it is far more likely that ubiquitous, self-replicating code that bounces to destinations through “jump hosts” – a self-replicating “Onion Router” of malware – led to his discovery because it tells the NSA exactly what any given computer is doing – or trying to do – without being caught. Or to put it another way, they see what you see.